This almond pista milk is healthy and also tasty, perfect for kids and adults and also works great as quick breakfast. 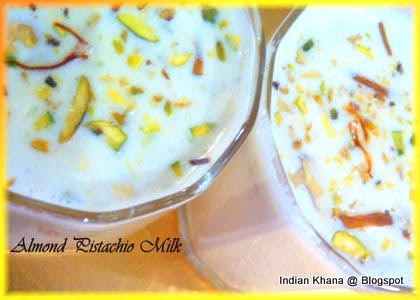 You can make the almond pista mixture and keep for almost 2 weeks in fridge and use as required. Do try this drink and enjoy it. 1. Soak almonds overnight in water or for 30mins in hot water, wash and remove the skin. 2. Make a paste of almonds, half of chopped pista with little water in mixi or blender. 3. In a pan heat little milk (3-4 tbsp) and add the paste, mix well and cook until the mixture becomes dry. Keep stirring to avoid burns. 4. In another pot or pan boil remaining milk, add 2 tbsp of the above mixture. If required add sugar or honey and cardamom powder. Garnish with chopped pistachio and almonds and enjoy your drink. You can also prepare the paste and refrigerate in air tight container, and use whenever required. it stays more than 2 weeks. Priti this milk is absolutely delicious and apt for all the events. Healthy & rich drink.. looks really awesome & yummy..
Slurp Slurp..yummy milk dear.Great for kids. Rich and yummy drink. Nice click. Beautiful pictures! This sounds creamy and delicious! Looks lovely :) Nice pictures Priti! yummy idea priti..i really feel like having a glass now..
wecall it masala milk...its yum!!! BElated birthday wishes to ur DH...seems like major fun!!! u didnt mention saffron, i guess we even add a little haldi to it!! That looks delicious. I actually have some milk in the fridge that is approaching the due date. This would be a great way to use it up! Thanks a lot for a beautiful contribution!